FIBARO Roller Shutter 3 is a device designed to control roller blinds, awnings, venetian blinds, gates and other single phase, AC powered devices. Roller Shutter 3 allows precise positioning of roller blinds or venetian blind lamellas. The device is equipped with power and energy monitoring. It allows to control connected devices either via the Z-Wave network or via a switch connected directly to it. To be installed in wall switch boxes. the Z-Wave Plus certificate and should be compatible with such devices produced by other manufacturers. The device is a Security Enabled Z-Wave Plus product and a Security Enabled Z-Wave Controller must be used in order to fully utilize the product. Connecting the Roller Shutter 3 in a manner inconsistent with this manual may cause risk to health, life or material damage. Connect roller blind motors with electronic or mechanical limit switches only. Make sure no part of the antenna sticks out of the wall switch box. Verify if the device is connected correctly. Arrange the device and its antenna in a wall switch box. Close the wall switch box . Installation of the gate driver may be performed only by certified professionals. The motor must be equipped with the appropriate limit switches. It is recommended to connect a NC (normally closed) contact of an IR barrier to S2 terminal. Opening the contact will stop the gate. In addition, it is recommended to connect an emergency stop button to the motors neutral (N) wire. In emergency, pushing the emergency stop button will cut the power and stop the gate. Arrange the device and its antenna in the installation box. Calibration is a process during which a device learns the position of the limit switches and a motor characteristic. Calibration is mandatory in order for the device to correctly recognize a roller blind position. The procedure consists of an automatic, full movement between the limit switches (up, down, and up again). If you notice the calibration process fail (e.g. it does not start, movement times are really short or highly inaccurate), adjust parameter 155 value (e.g. reduce it by half). parameter 151 is set to 1 or 2. Press and hold the same switch again for at least 3 seconds. The device will perform the calibration process, completing full cycle – up, down and up again. Test whether the positioning works correctly. Wait for the LED to glow white. The parameter 150 value will be set to 1 after calibration finishes. By default, time of transition between extreme positions is set to 150 (1.5 seconds) in parameter 152. Repeat the previous step until satisfactory positioning is achieved. Test whether the positioning works correctly. Correctly configured slats should not force the blinds to move up or down. parameter 151 is set to 5 or 6. By default, time of transition between extreme positions is set to 600 (6 seconds) in parameters 155 and 156. Set the main controller in Security S2 Authenticated add mode (see the controller’s manual). Scan the DSK QR code or input the underlined part of the DSK (label on the bottom of the box). Power the device (turn on the mains voltage). LED will start blinking yellow, wait for the adding process to end. Quickly, triple click the S1 switch. In case of problems with adding using the S1 switch, use B-button instead (located on the housing). SmartStart enabled products can be added to SmartStart enabled Z-Wave controller by scanning the Z-Wave QR Code present on the product. SmartStart product will be added automatically within 10 minutes of being switched on in the network range. Removing the device restores all the default parameters of the device, but does not reset power metering data. In case of problems with removing using the S1 switch, use B-button instead (located on the housing). If parameter 40 enables scenes for triple S1 click, disable it or use B-button instead to remove the device. If parameter 24 is set to 1, use S2 switch instead to remove the device. The device has a built in Z-Wave network main controller’s range tester. Remove the device from the wall switch box. Visual indicator pulsing green – the device attempts to establish a direct communication with the main controller. If a direct communication attempt fails, the device will try to establish a routed communication, through other modules, which will be signalled by visual indicator pulsing yellow. Visual indicator glowing green – the device communicates with the main controller directly. Visual indicator pulsing yellow – the device tries to establish a routed communication with the main controller through other modules (repeaters). Visual indicator glowing yellow – the device communicates with the main controller through the other modules. After 2 seconds the device will retry to establish a direct communication with the main controller, which will be signalled with visual indicator pulsing green. Visual indicator pulsing violet – the device does communicate at the maximum distance of the Z-Wave network. If connection proves successful it will be confirmed with a yellow glow. It’s not recommended to use the device at the range limit. Visual indicator glowing red – the device is not able to connect to the main controller directly or through another Z-Wave network device (repeater). The device allows for connecting switch to the S1 and S2 terminals. These may be momentary (recommended) or toggle switches. Switch buttons are responsible for managing the blind’s movement. After releasing the switch a spring automatically pushes back and disconnects the switch). Click switch – initiate up movement. Click switch – initiate down movement. If the blind is moving, clicking any button, will stop the movement. When operating venetian blinds it is possible to manage angle of the slats. Hold switch – initiate slats rotation up. Hold switch – initiate slats rotation down. Change switch state – initiate up movement. Change switch state – initiate down movement. Choosing a middle position stops the blinds. The device allows to operate gate motors. Gate motor should be connected to Q1 and Q2 terminals according to installation diagram. When operating gates a momentary switch may be connected to S1 terminal. It is recommended to connect an IR barrier, an emergency stop button or any alarm mechanism to S2 terminal. 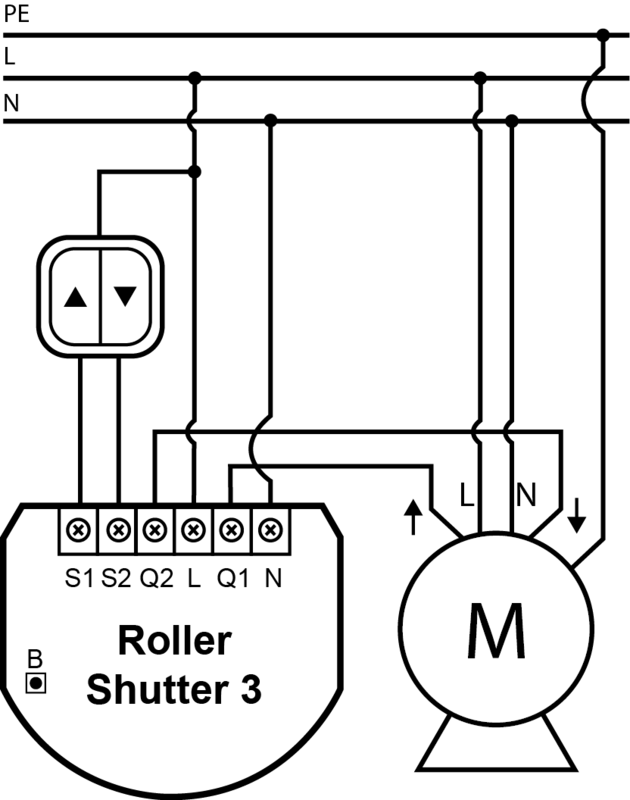 Opening a contact in a device connected to S2 terminal will always result in stopping a motor in current position. After opening S2 contacts – the gate will automatically start closing after time specified in parameter 154. Wait for the LED indicator to glow yellow. Resetting the device is not the recommended way of removing the device from the Z-Wave network. use reset procedure only if the primary controller is missing or inoperable. Certain device removal can be achieved by the procedure of removing described in Adding the device section. The device allows for the active power and energy consumption monitoring. Data is sent to the main Z-Wave controller. Measuring is carried out by the most advanced micro-controller technology, assuring maximum accuracy and precision (+/- 1% for loads 10W-1000W). Electric active power – power that energy receiver is changing into a work and heat. The unit of active power is Watt [W]. The device stores periodically (every hour) the consumption data in the device memory. Disconnecting the module from the power supply will not erase stored energy consumption data. ! The device can activate scenes in the Z-Wave controller by sending scene ID and attribute of a specific action using Central Scene Command Class. By default scenes are not activated, set parameters 40 and 41 to enable scene activation for selected actions. 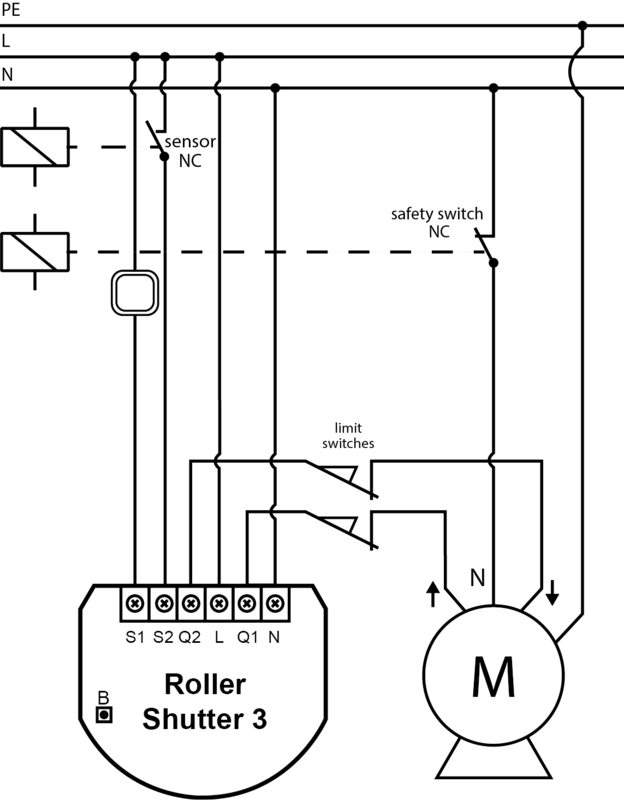 2nd association group – “Roller Shutter” is assigned to shutter position control – UP/DOWN (uses Switch Multilevel command class). 3rd association group – “Slats” is assigned to slats position control – UP/DOWN (uses Switch Multilevel command class). “LifeLine” that is reserved solely for the controller and hence only 1 node can be assigned. This parameter is not relevant in gate operating modes (parameter 151 set to 3 or 4). In this case switch always works as a momentary and has to be connected to S1 terminal. This parameter allows reversing the operation of switches connected to S1 and S2 without changing the wiring. This parameter allows reversing the operation of Q1 and Q2 without changing the wiring (in case of invalid motor connection) to ensure proper operation. INFO: Use the calculator below to calculate basic values for Alarm parameters (30-34). This parameter determines to which alarm frames and how the device should react. The parameters consist of 4 bytes, three most significant bytes are set according to the official Z-Wave protocol specification. This parameter determines whether the power metering should include the amount of active power consumed by the device itself. For loads under 50W, the parameter is not relevant and reports are sent every 5W change. Power reports are sent no often than every 30 seconds. This parameter determines in what time intervals the periodic power reports are sent to the main controller. Periodic reports do not depend on power change (parameter 61). This parameter determines in what time intervals the periodic energy reports are sent to the main controller. Periodic reports do not depend on energy change (parameter 65). By setting this parameter to 2 the device enters the calibration mode. The parameter relevant only if the device is set to work in positioning mode (parameter 151 set to 1, 2 or 4). This parameter allows adjusting operation according to the connected device. For Venetian blinds (parameter 151 set to 2) the parameter determines time of full turn cycle of the slats. For gates (parameter 151 set to 3 or 4) the parameter determines time after which open gate will start closing automatically (if set to 0, gate will not close). The parameter is irrelevant for other modes. For Venetian blinds (parameter 151 set to 2) the parameter determines slats positioning in various situations. 0 – slats return to previously set position only in case of the main controller operation. 1 – slats return to previously set position in case of the main controller operation, momentary switch operation, or when the limit switch is reached. For blinds (parameter 151 set to 1, 2, 5 or 6) the parameter determines the time after which the motor will be stopped after end switch contacts are closed. For gates (parameter 151 set to 3 or 4) the parameter determines the time after which the gate will start closing automatically if S2 contacts are opened (if set to 0, gate will not close). Power threshold to be interpreted as reaching a limit switch. This parameter determines the time needed for roller blinds to reach the top. For modes with positioning value is set automatically during calibration, otherwise, it must be set manually. This parameter determines time needed for roller blinds to reach the bottom.